The Borzoi breed of dogs came from Russia where they were used to hunt wolves. 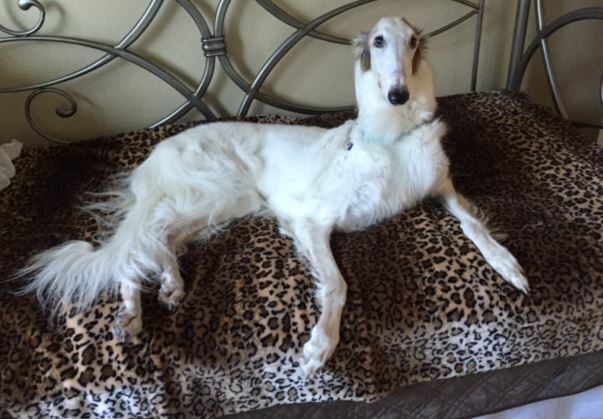 Borzoi have long thin bodies that are built for speed. I think of them as Greyhounds with long hair. They are part of the sighthound group which includes Afghan hounds, Basenji, Ibizan hound, Irish Wolfhound, Pharaoh hound, Saluki, Scottish Deerhound and whippets as well as greyhounds. Hypothyroidism caused by either autoimmune thyroiditis or idiopathic. Since sighthounds generally have lower levels of T4 and free T4, correctly making this diagnosis can be difficult. Testing for TgAA is used to look for dogs who are genetic carriers of this disease. Ophthalmic Disease including microphthalmia (small eyes) and chorioretinal disease. Although retinal degeneration is seen in Borzoi, it is under debate because the degeneration is different than what is commonly observed in other breeds. Cancer including hemangiosarcoma, lymphoma and osteosarcoma. In my experience, osteosarcoma (bone cancer) is more common in large and giant breeds of dogs. The most common places I see it are on the femoral and humeral heads. Bloat which is a life-threatening condition where the stomach fills up with gas. Although it can occur in any breed of dog, it is far more common in large, deep chested dogs. Heart disease including cardiomyopathy as well as valve disease. Allergies especially in the white coated dogs. Dysplasia of the hip and elbow. Degenerative myelopathy which is a progressive disease that results in paralysis.